Powered by D-Link 108G Technology, this D-Link DWL-G680 High-Powered wireless PCMCIA card is capable of delivering a maximum wireless signal rate of up to 108Mbps* when used with other D-Link Wireless 108G devices. The DWL-G680 is also backward compatible with virtually all 802.11b/g networks and devices. 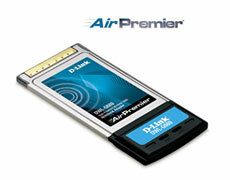 Go to this page to buy this D-Link DWL-G680 High Powered Wireless PCMCIA Card! Works great! Covers the 700 square feet with no loss.